BELIZE CITY, BELIZE, 30 June 2016--The Caribbean Regional Fisheries Mechanism (CRFM) joined in the celebration of fishers across the Caribbean on Wednesday, June 29, 2016, and particularly in festivities held in Belize, where the CRFM's headquarters in located, and where June is being observed as Fisherfolk Month for the first time. Speaking at ceremonies held on Wednesday morning, June 29--marked regionally and internationally as Fisherfolk Day, to recognize three outstanding fishers--Milton Haughton, Executive Director of the CRFM, said: "Fishery and by extension, our fisherfolk, have always been a big part of Caribbean economies. This is why today is such as special day on the calendar of fisherfolk in the region and globally." Haughton handed over a check for $200 to Cesar Muñoz, a fisherman of Sarteneja Village, Corozal, in northern Belize, who was chosen as Fisher of the Year in Belize for his notable contributions in promoting sustainable fishing practices. 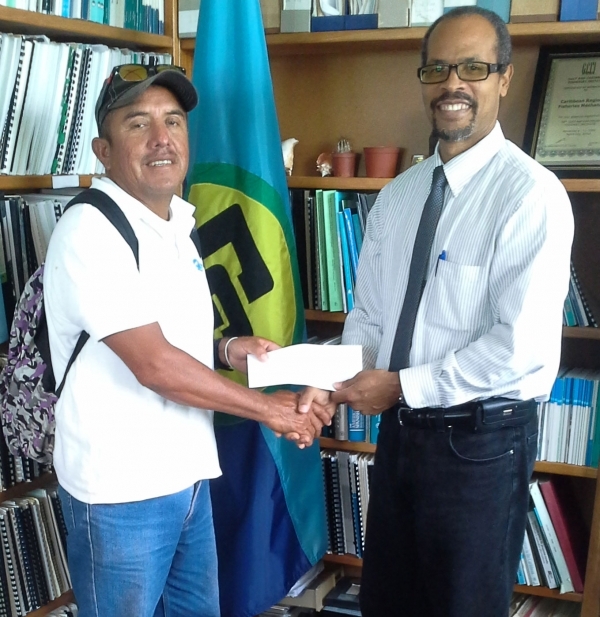 Muñoz is the chairman of the Sarteneja Fishermen Association. The annual Punta Fuego Awards are organized by the Wildlife Conservation Society in Belize, in partnership with the CRFM, the Belize Fisheries Department, the Caribbean Network of Fisherfolk Organisations and The Nature Conservancy. Guadaloupe Lampella of Riversdale in southern Belize, the sister of last year's Fisher of the Year, Anna Ramirez, was also recognized as an outstanding fisher at the event. So too was Juan Muñoz, a relative of this year’s winning fisher, who also hails from Sarteneja. "It is a time to reflect upon, acknowledge and recognize the very important contribution that fishermen and fisherwomen make to the social and economic development of Belize and the CARICOM countries," Haughton said. "The subject of understanding, securing and respecting the right of small-scale fishers is an important issue. In many countries small-scale fisheries have been marginalized and displaced and find themselves in conflict with a wide variety of interest groups and investors who are competing for access to resources used by fishers," Haughton added. The CRFM Executive Director emphasized that, "The time has come when we as a region must give more serious attention to the needs of our small-scale fishers, who often work under difficult circumstances and have been making such an important contribution to food and nutrition security, and who provide for their families and communities." Haughton pledged the continued support of the CRFM for fishers in Belize, as well as its 16 other Member States across the Caribbean. "We at the CRFM look forward to working closely with the fisherfolk and all other partners to secure the rights and livelihoods of fisheries in Belize and throughout the CARICOM region through the FAO Small-scale Fisheries Guidelines," he said. In concluding, Haughton acknowledged the hard work of fishers all across the Caribbean, adding that the CRFM "acknowledges, recognizes and commends the strong, hardworking, dedicated fishermen and fishermen and other fishworkers as well as their families."